Connect with PayPal (formerly Log in with PayPal) is a commerce identity solution that enables your customers to sign in to your web site quickly and securely by using their PayPal login credentials. Connect with PayPal is available free of charge. Embed the Connect with PayPal button. Then, complete the integration steps. Before you can integrate Connect with PayPal, you must set up your development environment. After you get a token that lets you access protected REST API resources, you create sandbox accounts to test your web and mobile apps. When you create an app, enable Connect with PayPal in the App feature options section. For details, see Get Started. Then, return to this page to integrate Connect with PayPal. 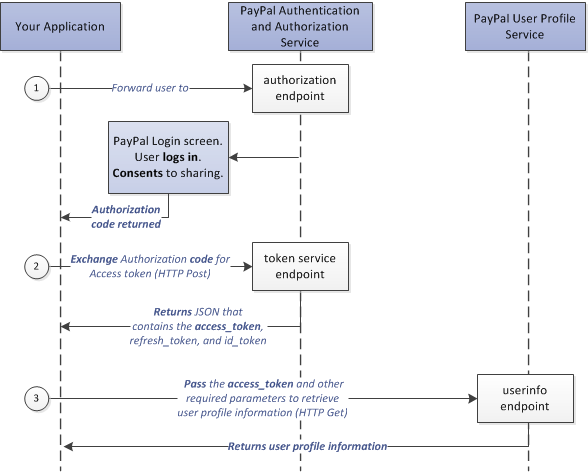 The customer clicks Connect with PayPal, which forwards the customer to the authorization endpoint. If the customer successfully logs in to PayPal and consents to sharing basic information with the merchant, PayPal passes an authorization code to the merchant. The authorization code is integrated into the Connect with PayPal button, which calls the authorization endpoint. For integration information, see embed the Connect with PayPal button. The merchant passes the authorization code received in the previous step to the tokenservice endpoint and receives an access token and refresh token. Authorization request header. The Base64-encoded client ID and secret credentials separated by a colon (:). grant_type. The type of credentials that you provide to obtain a refresh token. Set to authorization_code. code. The PayPal-generated authorization code. The access token expires after a short period of the time, so the merchant also receives a refresh token to periodically refresh the access token. "expires_in": "28800" String The number of seconds until the access token expires. Default is 28800. "refresh_token": " Refresh-Token" String The refresh token. "access_token": " Access-Token" String The access token. The merchant obtains the user profile information that the customer has consented to share with the merchant by passing the access token received from the previous step to the userinfo endpoint. For integration details, see get user information.